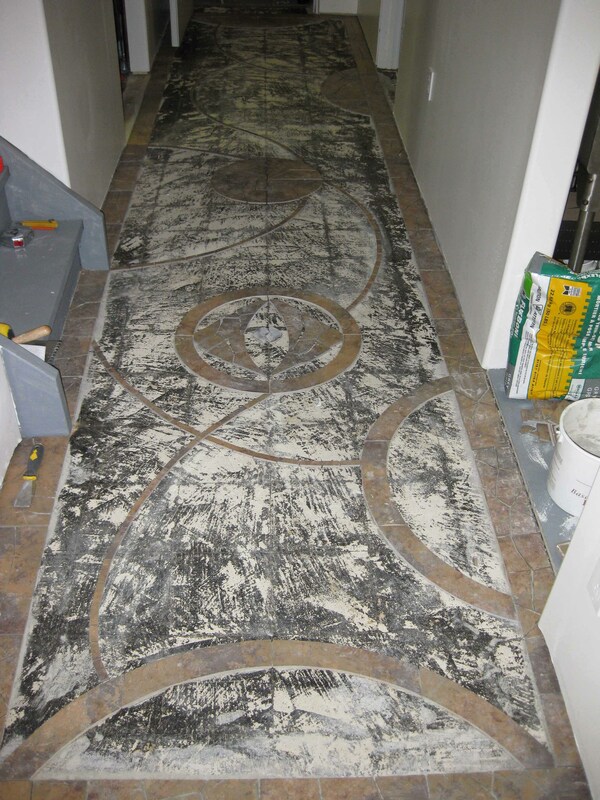 I began this floor project thinking I would just quickly put some lovely 12″ tiles down and be done with it. After ripping out the old rug and tile that was underneath it the floor was a mess. Well the floor wasn’t even enough for the tiles so I had two choices. One was to level the floor. I could do this but it wasn’t interesting. So I dropped a perfectly good, relatively expensive porcelain tile on the floor to see how it would break. There is a perverse pleasure that comes from doing something that challenges everything you have ever known. I have always been so careful. I pieced the broken pieces together in a random pattern and was hooked. I would solve my uneven floor problem by doing a mosaic floor. I asked my wife what she would like to see in the floor and she likes Mandelas. I can do that, and away I went. It was knee killing, back breaking work, but I loved it. Here is a picture of the early stages. This was the beginning of the floor. Carol helped layout the lines I wanted for a feeling of movement. Carol made this post in her blog when I finished the floor leading into her studio. Check it out at silverspringstudio.com. While you are there you may want to check out her entire blog.